This week I’ve had two new experiences thanks to my various professional associations – never let anyone tell you librarians don’t like to try new things! I must admit that neither manuscript illumination nor stand-up-paddleboarding were activities I’d previously thought of as networking opportunities, but I had lots of fun trying them both in company with some great groups of people. 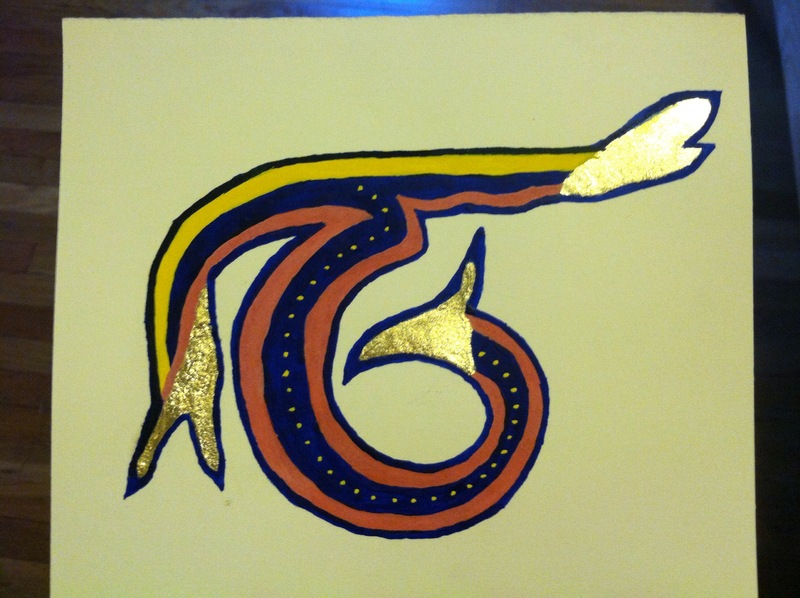 Last Saturday I spent most of the day in a workshop on manuscript illumination. Instructed by the artist Rebecca Allan, we learned how to transfer our chosen design, apply metal leaf to specific areas, and then make our own egg tempera paint and use it appropriately. I think all of us found various parts of this challenging in different ways, but everyone seemed to have a good day. I selected an initial from the book of Kells, and then did my best to simplify it to a level that might work for my limited artistic abilities. Making the paint was a satisfyingly hands-on activity: egg tempera is created by cracking and separating an egg, using a thumb-tack (or other spiky object) to puncture the yolk, squeezing out the centre of the yolk before discarding the membrane, adding a little water and then dropping a little of the mix into pigment paste of the required colour. We were mainly using natural pigments, so the resulting paint tended to separate quickly, but it gave a lovely translucent effect. It turns out that the jewel colours in Medieval manuscript illumination are the result of many thin layers of paint, painstakingly applied with tiny brushes, and having spent a couple of hours doing this myself I have a heightened respect for their artistic abilities and craftsmanship! Stand-up-paddleboarding is something I’d been wanting to try for ages, so I was delighted when a friend offered to organise an after-work group outing. It ended up being a beautiful evening, with a light breeze, and bobbing around on the Hudson as the sun set over New Jersey and all the Manhattan lights came on was really special. 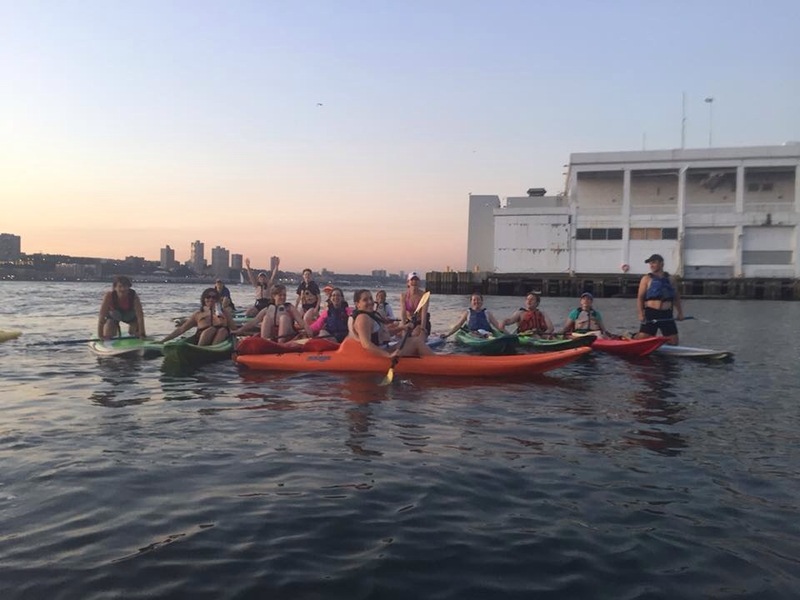 Paddling (and photos) thanks to Kara Masciangelo! As for the paddleboarding itself, I loved it! It turns out that skiing is just the right preparation for the leg muscles required to stand up and balance on the board, and the basic paddling technique was easy enough to understand. Within just a few minutes I was up and paddling happily around the embayment, and with a few pointers from a more experienced friend I was moving a little more efficiently. After some time by the pier we ventured a little way upriver, where our mixed group of kayakers and paddleboarders rafted up (eventually) for group photos before heading back in. Out of the shelter of the pier the waves were somewhat larger, and from the standing-up viewpoint looked larger still, so I knelt down for part of the return journey in order to avoid taking a dip in the river! Wine and nibbles back on the dock provided the perfect end to the evening, and I would love to go again some time. 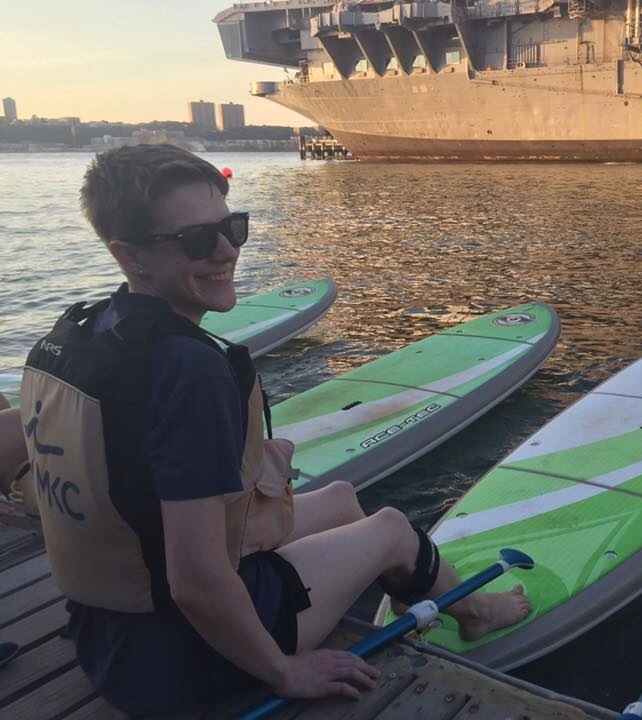 This entry was posted in Exercise, Living and tagged manuscript illumination, networking, stand-up-paddleboarding, workshops by Emma Davidson. Bookmark the permalink.